Jerry Terrell was a bit of a rarity during his playing days. He had a degree in accounting and looked the part; he wore glasses on and off the field. Never a great hitter, he was beloved by fans and managers alike for his hustle on the field, his versatility (Terrell played eight of nine positions at least once in his major-league career), and his team spirit in the clubhouse. Terrell was listed at 6-feet, 170 pounds and seemed to be always running. He would run from the dugout to the on-deck circle to the plate, where he choked up on his 31-ounce bat and seemed anxious to get out of the box to first base. Terrell was also a man of conviction off the field. He was the Twins’ chapel leader for several years and won the 1980 Danny Thompson Award for exemplary Christian spirit in baseball, the same year in which he cast the only vote against a players’ strike. Terrell was born in Waseca, a town of about 10,000 in the south-central part of Minnesota. He grew up in nearby Elysian and graduated from Waterville High School. From 1965 to 1968 Terrell attended Mankato State University, where he earned his degree while playing baseball for the school as well as in the Metropolitan Collegiate League in the summer. Terrell carried a .301 career batting average in college while his teams went 72-41 in his four years at Mankato State. In 1966, Terrell attended a Twins tryout camp. He impressed the scouts at the camp but was unable to sign because he wasn’t yet 21. Two years later, however, the Twins selected Minnesota native Jerry Terrell in the eighth round of the 1968 amateur draft. He immediately started playing with the Auburn Twins of the short-season Class A New York-Penn League. After batting .296 in his first season with Auburn, Terrell missed the entire 1969 season due to service in Vietnam. When he returned for the 1970 season, he was sent to Lynchburg in the Class A Carolina League. He played the full season there and batted .279. While his batting totals looked pretty good in the low minor leagues, Terrell really made a name for himself with his glove. Primarily a second baseman, Terrell led the league in most defensive categories in both 1968 and 1970, and it was on the strength of his defense and his speed that he continued to progress towards the major leagues. In 1971 Terrell found himself playing second base for the Charlotte Hornets in the Class AA Southern League-Dixie Association. (The Southern League and Texas League played an interlocking schedule in 1971 and together were known as the Dixie Association.) Terrell’s fielding and speed on the bases helped the Hornets to win the Dixie Association championship. He came up particularly big in the semi-final playoff series against Asheville as his two-run triple led his team to victory in Game One, while he scored two runs in the second game although Charlotte lost. The Hornets won the deciding game of the series and then beat Arkansas in the Dixie Championship. Though he initially figured to fill a utility role, Terrell became an everyday player early in 1973 due to several injuries to starters. It wasn’t long before Terrell ran into some adversity. In early May he learned that his mother had lost two of her fingers in an accident with a meat grinder. Around the same time, Terrell fell into a hitting slump. He recovered enough to finish his first season with a .265 batting average and a spot on the Topps All-Rookie Team. Voted the Twins’ Rookie of the Year in 1973, Terrell came to spring training the following year with the reputation as one of the top hustlers in baseball. Terrell even posted the fastest mile time in the Twins’ training camp when he finished in 4 minutes and 30 seconds. In an effort to improve his batting, Terrell had worked on switch-hitting while he played winter ball in Venezuela. Originally a right-handed hitter, Terrell had some success from the left side of the plate in the spring of 1974. When the Twins broke camp, Terrell was leading the team in hitting with a .476 average, .481 from the left side of the plate. Despite his success in the spring, Terrell once again figured to fill the utility role for the Twins. With Rod Carew ahead of him on the depth chart, Terrell decided that it was in his best interest to take an active role in the game from the bench. He felt that he had a job, even when on the bench, to keep the rest of the team charged up, and Terrell took that job seriously. After an early-season hitting slump, Terrell abandoned the switch-hitting experiment and batted from the right side for the rest of his career. He finished the 1974 season batting .245 while playing just about every position on the field, including 12 games as a designated hitter. Though the fans had taken to him, Terrell’s place on the team was far from secure. After struggling through spring training in 1975, Terrell was sent back to Tacoma. Terrell looked at the demotion as an opportunity to play every day, but his position as a favorite among Minnesotans meant that the organization was sure to hear about the move from the fans. A petition protesting Terrell’s demotion began circulating in Terrell’s hometown of Elysian and made its way to owner Calvin Griffith’s desk with over 3,000 signatures. Griffith, never one to forget that he was running a business, offered to “gladly” accept the petition if each and every one of the signers bought a ticket for the home opener. While the fans did not take up Griffith on his offer, Terrell was making a case for himself in the Pacific Coast League. A 28-game hitting streak and a .320 batting average in 45 games at Tacoma made Terrell hard to overlook, and on June 5 he was recalled to the Twins, where he stayed for the rest of the season. Terrell began the 1976 season as the starting second baseman (Carew had been moved to first base) for the Twins but quickly lost that job to rookie Bobby Randall. He remained with the team in a utility role. That year he appeared in at least one game at every position except for pitcher and catcher. Terrell’s contract status was up in the air for a good portion of the 1976 season. Terrell played without a contract for much of the summer. He didn’t come to an agreement with the Twins until early August. 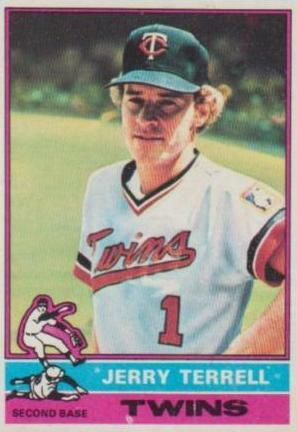 Terrell filled basically the same role for the Twins in 1977, though once again he did so without a contract. The Twins made no effort to sign Terrell, so he played out his option that year, filling holes wherever necessary. When the season came to a close Terrell was a free agent. It was reported that there were 10 teams interested in Terrell, including the Twins. He ultimately signed with the Kansas City Royals and split the utility role with U.L. Washington. In addition to his on-field duties, Terrell’s Kansas City teammates elected him to serve as the team’s player representative to the players’ union. A fractured right ankle that Terrell suffered in the closing days of the 1978 season meant that he would start the 1979 season on the disabled list. Terrell was playing for the Royals by May but missed another month in the middle of the season due to a fractured finger. Still, Terrell managed to make an appearance as a pitcher in a blowout loss to the Yankees in late August. Terrell retired the Yankees in order in the ninth inning. It was the first of two pitching appearances Terrell made in his career. His career line: two innings pitched, no runs allowed. Interestingly, Terrell’s fellow players were not publicly upset with the dissenting vote. It was reported that the dissenter was “a special situation” and that his views were understood by teammates. After a rough start on the field in 1980, Terrell was optioned to Class AAA Omaha in the middle of May. Terrell, true to his character, saw the demotion as an opportunity. He initially saw the move to Omaha as a “little vacation for me and my family.” At Omaha, Terrell got the chance to play every day and thrived, saying that he felt “like a kid again.” He was a September call-up for the Royals, though that short stint turned out to be his last in the major leagues. Terrell’s return to the Royals came after the September deadline, so he was not eligible for postseason play. Still, he was considered a valuable enough member of the team that he was in the dugout in uniform for every postseason game the Royals participated in, all the way through the 1980 World Series. Despite the fact that Terrell spent much of the 1980 season in the minor leagues, he was presented with the 1980 Danny Thompson Award, an award given annually for “exemplary Christian spirit” in baseball. It was the second consecutive year that Terrell was nominated for the award. He received the honor before Game Four of the 1980 World Series. Terrell’s career as a player was over, but he has remained active in baseball to this day. Since his retirement as a player in 1981, Terrell has spent the better part of three decades as a scout and minor-league manager for various organizations. Making his permanent residence in Kansas City, he was one of the advance scouts credited with bringing information to the Royals prior to their 1985 World Series win and had a stint as an advance scout for the Minnesota Twins in the late 1980s. Terrell has also been a minor-league manager for various organizations, the most recent of which was a run in the White Sox organization in 1999 and 2000. “Passum, Bam-Bam Strike Terror for the Twins” by Bob Fowler, The Sporting News, April 21, 1973. “Twins have Eye for Terrell’s Figures” by Bob Fowler, The Sporting News, July 14, 1973. “Twins Point to Terrell as No. 1 Hustler” by Bob Fowler, The Sporting News, April 13, 1974. “Super Sub Terrell Also a Cheerleader” by Bob Fowler, The Sporting News, August 17, 1974. “Talent Larder of Twins Bulging—For a Change” by Bob Fowler, The Sporting News, May 3, 1975. “Players’ Next Move: Setting a Strike Date” by Murray Chass, The Sporting News, April 5, 1980. “Terrell Won’t Admit ‘Nay’” by Del Black, The Sporting News, April 19, 1980. “Reggie Real Stickout, Despite his .273 Bat” by Peter Gammons, The Sporting News, July 25, 1981. “Former Royals Teach Baseball Basics” by Jeremy Hoeck, Yankton Press & Dakotan, June 17, 2008.